Just wanted to send a letter of appreciation to let you folks know how much we love the CE 240/30mm model that we purchased. At ABnote in Boston we are primarily a gift card/ credit card manufacturer. Last year we started a new project producing passport books for another country. One of my projects was to find a banding machine that was easy to use and durable for this project which is over 2,400,000 passports. I had visited our other plant in Tennessee and noticed they had a Wexler Banding machine that had to be over 10 years old. They told me how easy to use and durable the machine was over that time period. I took note and started investigating Wexler Banding Machines. I contacted your people there and in very short time Kristyn Shaner called me to set up a demo. First off Kristyn was fantastic. She came to our facility with the machine and offered to leave it for 5 days for demo purposes. Kristyn was very knowledgeable about the machine and other banding equipment. She went through the machine top to bottom and demonstrated how easy it was to use and set up. Kristyn also went out of her way to stay in direct contact with me to see how things were going. Needless to say we didn’t even wait the 5 days to decide to purchase. Wexler Banding is very lucky to have a salesperson like Kristyn. Our operators love the machine. It takes up such a small footprint but accomplishes a huge job. We have bundled over 500,000 passports already and haven’t had one issue with the machine. Once again just wanted to thank you for such great service.  We have many new projects ahead of us and Wexler will be the only company I will contact if additional banding equipment is needed.